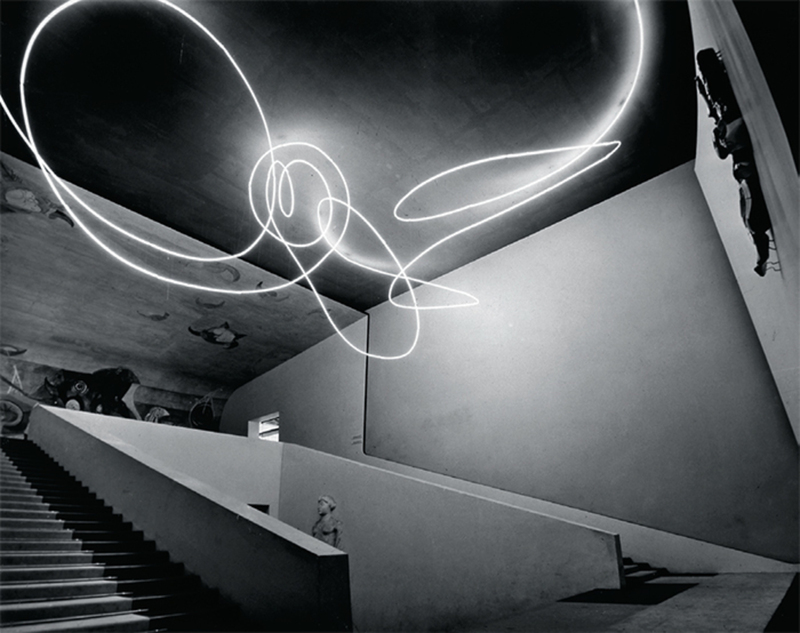 Lucio Fontana, Struttura al neon per la IX Triennale di Milano (Neon Structure for the 9th Milan Triennial), 1951, crystal tube, neon. Installation view, Palazzo dell’Arte, Milan. Most art-world denizens know Fontana as the maker of punctured and slashed monochrome canvases that seem to embody the nihilism and lingering violence of the postwar discourse on gesture. Few conoscenti, however, have closely read Fontana’s manifestos on Spatialism, which contextualize his plastic works as research into space, light, technology, and the cosmos. Fewer still have experienced his Spatial Environments, the immersive installations that occupied much of his last decade. In collaboration with the Fondazione Lucio Fontana, this show will reconstruct nine such environments at full scale, many for the first time since the 1960s. Filling the HangarBicocca’s industrial nave with labyrinths of light, mirrors, fluorescent paint, and rubber floors, this historic exhibition promises a rare opportunity to plunge into the mature work of one of the twentieth century’s most electrifying artists.